The exams at Nanyang had just ended and here we were ready to hop onto the next big thing: preparations for the regional Venture capital Investment Competition or VCIC in short [investments] held in Hyderabad! When we arrived in Hyderabad, we were greeted by our host, Ashutosh Singh, a representative from the Indian School of Business (ISB). Both teams set off to the beautiful ISB campus, located just about half an hour from the airport. We were definitely looking forward to our two-day stay there since we met with such a dynamic campus upon first glance. It was past midnight when we arrived but the campus was vibrant with life and loud music! Ashutosh explained that since the students would be graduating in May, and they were just enjoying the time they had left in the school. Following the extremely satisfying breakfast, we headed to Irfan’s room for a discussion. We had an intense group discussion, with questions, answers and rebuttals all thrown in the open. We drilled each other on the merits and weaknesses of the different companies. We really had to push ourselves since we were only to be given 15 minutes to decide on the actual day. Time completely flew by and it was suddenly already 7pm, time to go for the scheduled cocktail. It was a great experience, interacting with the hosts and other participants. We understood more about the different nationalities, as well as experiences and campus life in ISB. It’s too bad I’m already in my final year, otherwise I definitely wouldn’t pass up an opportunity to apply for an exchange program at ISB! After the cocktail, we proceeded to the dining hall. We had several rounds of beer and then we were served the “Hyderabad Nasi Briyani”. Our host had mentioned that a stay in Hyderabad wouldn’t be complete without tasting this most famous local dish, and it truly was scrumptious! The next thing should naturally be to wash up and head to bed but no, the team headed back to the library to solidify our analyses and arguments. Fortunately, none of us is tipsy so we managed a four-hour intensive discussion on our cases once more. Coffee was a constant drink for all of us, and finally at 4am, we finally headed back to our rooms. I told myself, “Kelvin, you better get some sleep.” I was still so anxious about the competition! “The Big Event” day came, and this time, breakfast was much too quick. We gathered at the competition venue and met with the venture capitalists, the four start-up entrepreneurs. We were tasked to make the choice to invest in only one company, and we were to choose between Sacona, United Mobile Apps, Quantama and Nuru. During their presentations, you can really feel the dedication and determination of the entrepreneurs. It was so exciting to watch! After the presentations, our belief in choosing to invest in Nuru, a start-up company that provides low power energy solutions to households in rural areas, was reaffirmed. During those intense ninety minutes, we were shuttling between different seminar rooms, as we posed our questions to the entrepreneurs, seeking to either clarify our doubts or strengthen our investment thesis. There was never a dull moment! Subsequently, we ‘locked’ ourselves in a room to prepare our final investment thesis and to make our final investment decision. Our conclusion was still to go with Nuru, so we moved onto discussing our strategy and approach to the investment process. We were too engrossed with our work that we completely forgot about lunch! Fortunately, and thankfully, our gracious host brought us some food. By 3.30pm, we were led to a lecture theatre, where we were to propose our investment thesis to the panel of venture capitalists, as well as the entrepreneurs from Nuru. Immediately after the presentation, we were given feedback on our approach and investment decisions. Receiving advise from a panel of seasoned venture capitalists was such a privilege as well as an honour. Personally, that was the biggest takeaway from the entire trip. Their advise and comments were highly insightful and gave us many more options to explore. It made us view our work in different angles, and it definitely broadened my scope of thought. We were able to relax only when it was time to wait for the results. Unfortunately, we didn’t win, and it was sad that we didn’t manage to bring glory back to the Nanyang Business School. However, I don’t think there was any loss at all. The trip was memorable and the experience is irreplaceable. Regardless of the outcome, the hard work was worth it. I strongly encourage the incoming students to participate in the VCIC competition. It was such a rewarding journey, especially if they desire to get into the investment field. 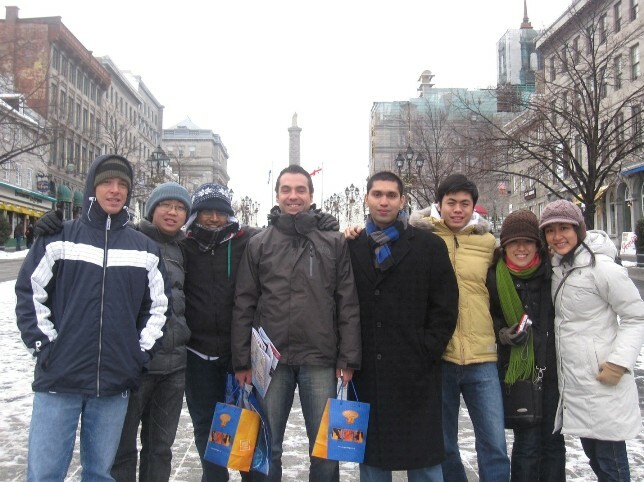 For the 3rd straight year, Nanyang is sending a team for the 30th John Molson Case Competition in Canada, held from 3 to 8 Jan 2011. Our team is representing the Nanyang Business School, after beating a few teams at Nanyang. he selection process for the NBS team was an in-class case competition among aspiring teams, during the New Venture Practicum course. We were really excited when we heard about our being chosen as the team and were proud to represent NTU at the competition. On the first day, the committee organized a city chase in the morning to familiarize the participants with the city and the neighborhood. After going through administrative procedures in the afternoon, we had the opportunity to meet the other 35 competing schools at the cocktail lounge. 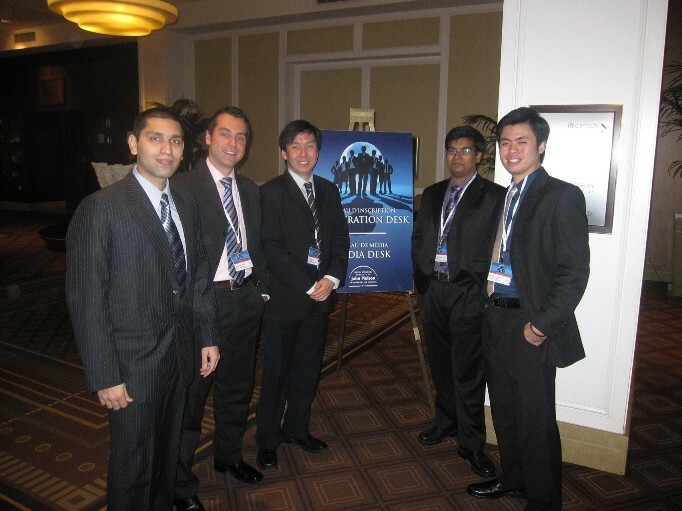 Our Team, comprised of Irfan , Alex , Marcus ,Manu and Joseph newly arrived at the competition center. On the second day, all the participants had their game faces on as they eagerly waited for the actual competition to start. The schedule and mechanics of the competition were straight forward. The entire competition lasts for a total of five days. Three and a half days were allocated for elimination, half a day for semi-finals and the last day for the finals. 36 competing teams were segregated into 6 divisions. The elimination round was a head-to-head, round-robin system where we would have to compete against the other 5 teams in our division. The scoring system was a bit complicated. Judges would have to split a total of 11 points between the competitors. The gap between the winner and loser can be as wide as 11 – 0, or as close as 6 – 5. The actual mechanic for the case analysis and presentation was again pretty simple. Groups were brought in to isolated rooms wherein they were given three hours to analyze a case. After three hours, teams would have to proceed to the presentation room where they were given 25 minutes to present, and 15 minutes to answer questions from the judges. The exceptions were the “live” case in which a team is given only 2 hours to prepare and a “short” case wherein a team had only 15 minutes to present. The analysis was all written down in transparencies and presented using an over-head projector. 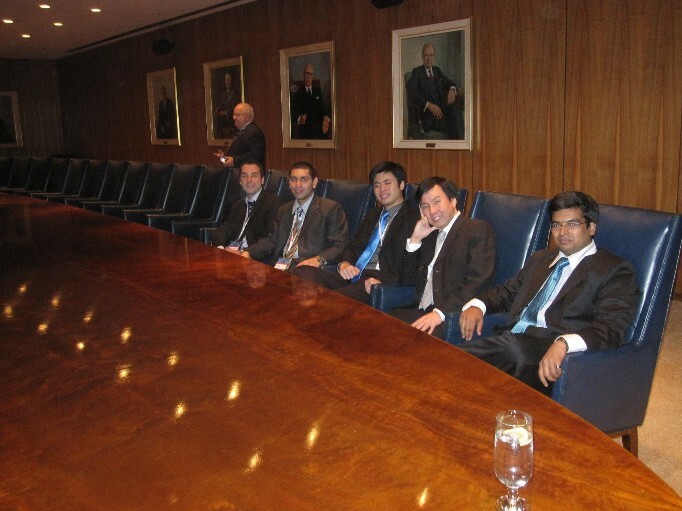 Our Team, sitting relaxed in the presentation board room, while waiting for the competition. The competition was very tough as most of the schools came in well prepared. Just like our school, many schools had a special course designed specifically to prepare students for this competition. Though the strategies or analysis were quite similar across the teams, the presentation styles were clearly different. Some teams were really polished, in the sense that they already had a certain routine prepared. They were even trained on using the transparencies which was evident with creation of on the fly templates on transparency. Given the amount of lead time between selection and the competition and the number of relevant courses our team members have done, we performed really well. We believe that some aspects of the competition, specifically presentation, can be learned and further improved. On the other hand, we felt really proud of ourselves, knowing that our ideas and creativity gave us an edge over our competitors. In fact, we were able to beat Queen’s School of Business who were the runner-up at the end. All-in-all, the competition gave our team valuable insights about our strengths, weaknesses and team dynamics. One lesson we learned is that our team excelled in thinking out of the box. 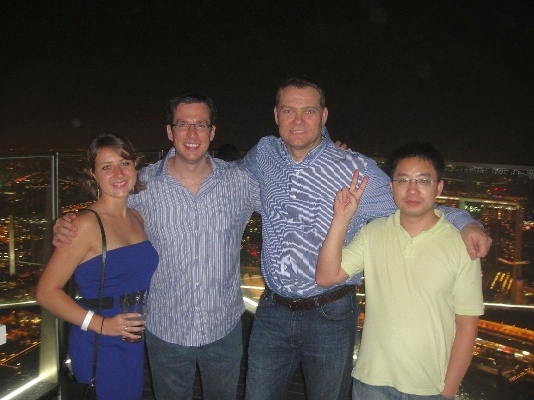 Furthermore, our team members complimented each other in terms of knowledge and contributions. On the other hand, we realized that presenting collectively is a skill that we had taken for granted. In addition, we understood the importance of composure in such competitions. On the lighter side, the organizing committee made sure all the 36 schools got enough time to interact with each other. To achieve this, they organized a networking event every evening – cocktail night, ball dance, hockey night. They even had a learning session for ball dance. We also attended informal networking sessions every night at the hotel, where we discussed the proceedings of the day and also discussed on the strategy changes the next day. The best part about this competition was that not only we got to meet peers from schools all around the world, but also the coaches of those schools were open to sharing where they thought our team was going wrong and what should we focus on. So, the competitors during the day time became your friends and teachers in the evening. 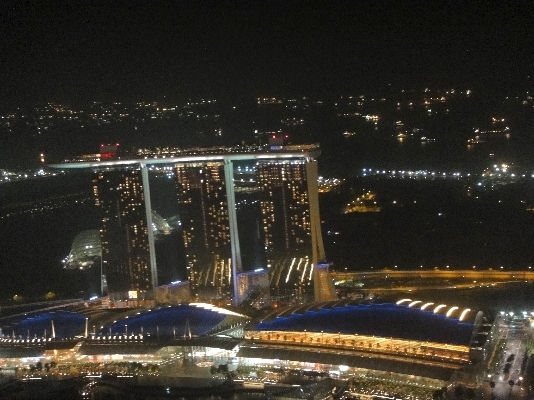 Last week we had a social event for The NANYANG MBA students sponsored by the MBA Student Executive Committee, and organized by EXCO VP – Social and Sports, Andrew Humphreys (USA). The timing couldn’t have been better as we were also able to welcome EMBA students visiting Singapore from the Norwegian School of Management, as well as a group of MBA students from SungKyunKwan University (SKKU) of Korea. One of the SKKU students was recently at NTU as an exchange students, and the EMBA from Norway were introduced by a visiting NTU professor who also teaches at their university. Also on hand were students such as myself in the joint Nanyang-Waseda Double MBA, and from the Nanyang-ESSEC (France) Double Masters program. 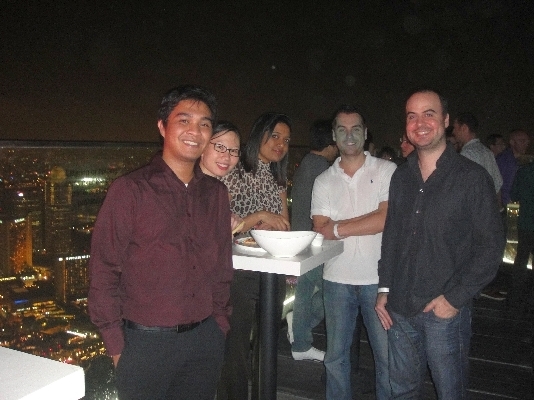 The event was held at Singapore’s 1-Altitude which features an open air patio 62 stories above the city. 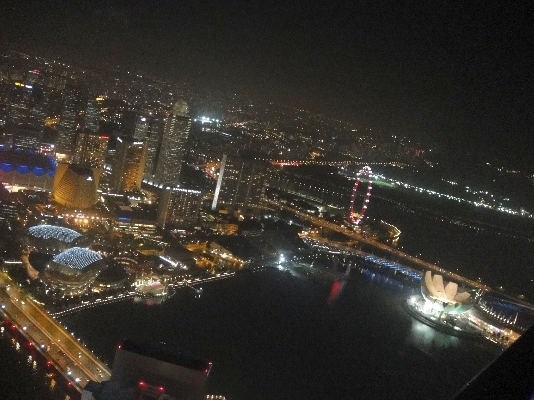 The view is the best in Singapore. Although it was rainy all day prior to the event, as people started to arrive the clouds cleared up and the weather couldn’t have been better. This is definitely the best venue when you want to provide guests with a memorable experience. 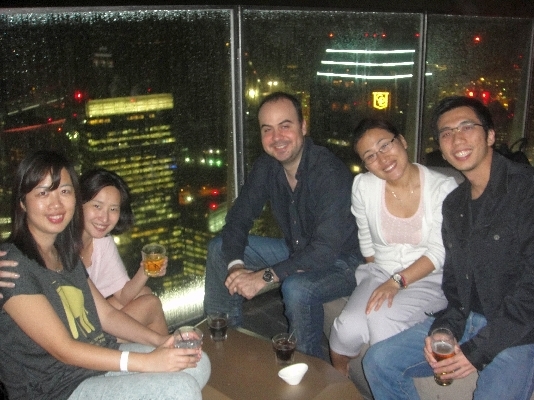 As many of the Nanyang MBA students had not yet visited this patio, it was a great opportunity for them as well! 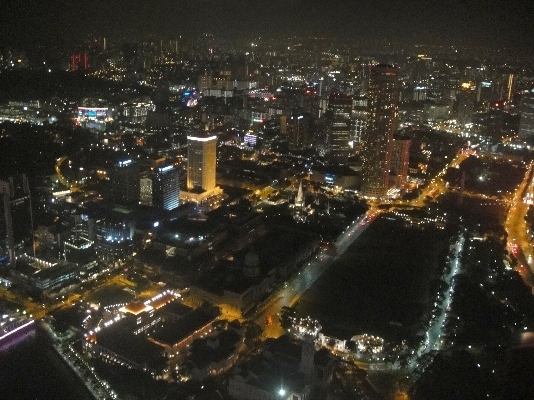 We are planning additional events (coming up soon) and hope to continue to provide unique and interesting experiences for all of the Nanyang MBA students and , yes for our guests too..